k.d. lang joins the cast of After Midnight running right now until March 9th. Even if she wasn't involved it would be completely worth your time seeing such a fantastic cast of dancers, singers, performers and the spot-on Jazz at Lincoln Center All-Stars. I saw this show at City Center last year, as a special performance called The Cotton Club Parade, and this transfer to Broadway maintains all the excitement, fun, and pure musical talent. Click the above link for more information. Can We Come To The Table? "From Alan Bounville’s 6,000-mile walk across the USA for gender and sexual orientation equality, comes the new interview-based play, Can We Come to the Table? - Stories About Gender Identity, Gender Expression, & Sexual Orientation. The play includes meticulously transcribed stories with people Bounville met along his walking journey." 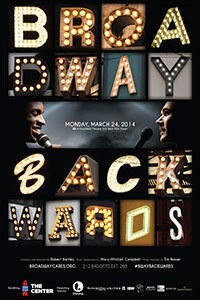 Broadway's hottest young stars will join legendary performers of the Great White Way for the ninth annual edition of Broadway Backwards, a one-night-only performance produced by Broadway Cares/Equity Fights AIDS and benefiting BC/EFA and the Lesbian, Gay, Bisexual & Transgender Community Center of New York. The roster of Broadway stars joining this year's Broadway Backwards includes Bryan Batt, Tony Award nominee Stephanie J. Block, Tony winner Len Cariou, two-time Tony nominee Robin De Jesús, Tony nominee Jonathan Groff, three-time Tony nominee Judy Kuhn, Tony nominee Jessie Mueller, Krysta Rodriguez, Cass Morgan, Tony Yazbeck and Patricia Morison, Broadway's original "Kate" in Kiss Me, Kate and a veteran of several other original Broadway companies including The King and I. Additional performers will be announced in the coming weeks. Performers subject to change. VIP tickets include premium seats and a special post-show party with the cast. A limited number of "Backstage & Beyond" ticket packages also are available, which include the opportunity to see the dress rehearsal, exclusive backstage access, a "meet and greet" with some of the stars of Broadway Backwards, premium seats for the show and more. Broadway Backwards is the annual celebration where gays and lesbians see their stories told through the great songs of musical theatre, sung by their favorite Broadway performers.It began as a grassroots concert performed at the Center in 2006. In subsequent years, the event grew quickly, performing Off-Broadway, then on Broadway for the last five years. Last year's sold-out show raised a record-breaking $347,060 for the two organizations. Creator Robert Bartley will again direct and choreograph, with additional choreography by Amy Jones and Melissa Rae Mahon. Mary-Mitchell Campbell returns as music supervisor with Tim Rosser as music director.